Model name :mini-32,size :1 chute,32 channels. 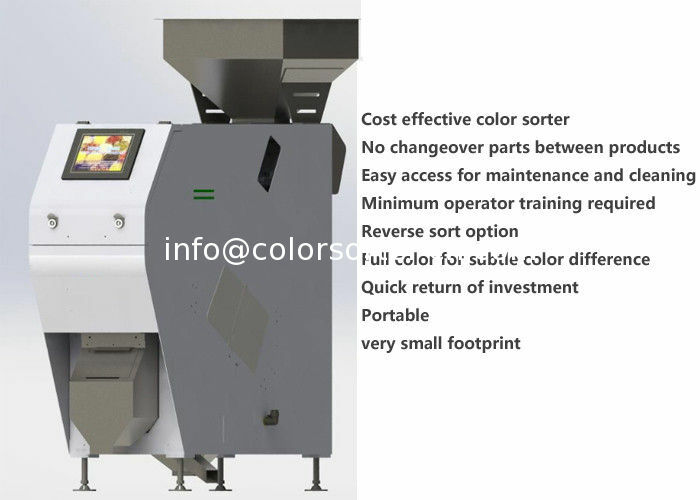 The mini color sorter machine is suitable for sorting vegetable seeds,coffee beans,beans,sesame seeds,rice,cerals,and corn seed.The machine could reject subtle color difference,discoloured product,foreign material,spot defects. Applications:small and medium sized applications ,product R&D,Laboratory use. Additionally,the small color sorter machine is offering an added benefit of minimal operator training by utilizing an intuitive full color user interface touch screen and the ability to automatically set sorting parameters. Red, green, blue+ shape 4D data integrating technology, intelligent study, intelligent recognition, intelligent classification, intelligent positioning. 1. Sorting accuracy: The content of normal material granule in finished product material, after color sorting of the material containing different color granules. 2. The above color sorting performance takes about 2% rice or wheat as example. Specific indicator will change with different materials and impurities. 3. The product is updated without further notice, but the fact of machine will prevail.